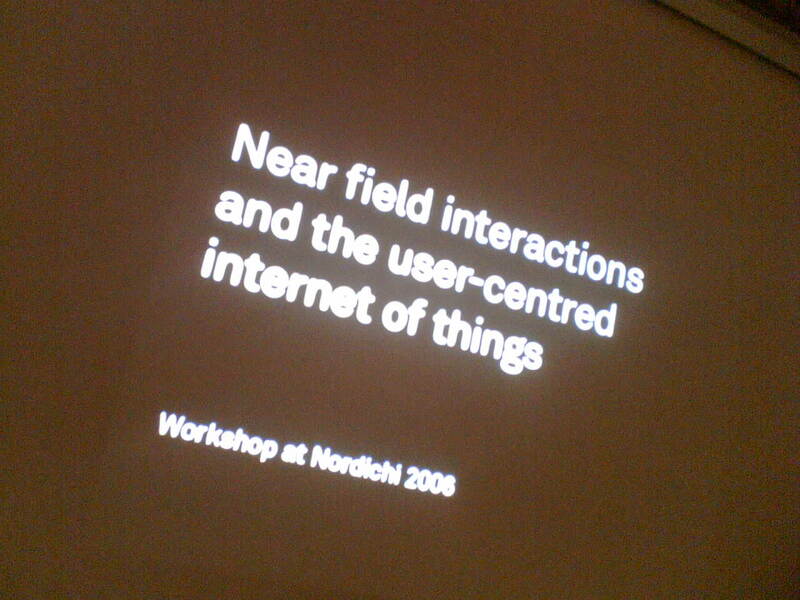 A kind of super-quick synthesis of the main highlights from our workshop at NordiCHI "Near Field Interactions the user-centered internet of things". This is not the final report and it only reflects what I found relevant with regards to my research practices. Timo started by introducing the aim of the workshop. His point was to start with some examples of the industry view of the Internet of Things (arphid-like supplly chain management...) and stating that we would like to address the other side of the coin: from the user's viewpoint, how would this look like? He then listed some possible examples of such approach: blogjects, spimes, everyware or spychips. Actually, near-field interactions (now allowed by NFC technology) could be a way to meet this end: it brings new way to interact with technology raising important questions about near-fieldness and touch. Timo then quoted applications such as Thinglink (ulla-maaria mutanen), NFC presence (janne jalkanen), hovering, cookies (katherine albrecht), "pick, drag and drop" or spyware (people avoiding to be tracked by puttin copper lines in the pockets of their jeans). With this characteristics (near-fieldness and touch), and those technologies, the interface semantics might change leading to new way to bridge first and second life (physical/virtual environments). These tropes could create new affordances and the workshop was meant to explore that. Chris Heathcote described how NFC is about what is here (near-field interaction) and he wondered about what happen when you're not here... how would I access to "my things far away"? what would be "actions on my things far away"? He presented some examples like Smart2Go which allowed to get an helicopter view starting from one's location to see what is around. The same goes with time: NFC is about the present but how can I access past interactions? Another concerns he had was that "a touch is a touch" so it's discrete but can we record other touch so that we make something out of it? (To which Timo added that he read how the Nintendo Wii will log every user interactions in the internal calendar). Actually, Chris listed the design decisions they made at Nokia when describing the NFC standard specifications. Ben Cerveny explained how people won't understand these new affordances easily: or only if they are drawn to it step by step. That's what he explored in his recent work, by learning how people interact with objects and presenting clues of how interaction might takes places so that people know how to interact with them. Ulla-Maaria talked about how to create "social affordances" for material objects (According to Gibson, affordances = material properties of an object that indicate the possibilities of interaction with it). So how could affordances could be socially constructed and shared? She is interested in how to do that but not in a pre-determined way, rather as a user-generated manner. Her point was that it would pertinent to add objects with a new property: personal relation to the object. For instance, it could be about tagging an objects "I made it/I own it/I like it/I want it...", so that it accumulates and it is hence organized around shared motives. Matt Biddulph then exemplified what a middleware for such a system would work. Also with an interest about bottom-up approach, Alexandra Deschamps-Sonsino focused on how to design for sustainability: how to do more with less. To her, personalization could be a solution for users to engage with high-tech devices and not trashing them two months after buying them. She showed how the "positive history" an user have with an object could be of interest: "I want to keep that things because I made it and it reflects my positive history with it": the design trop here = beyond product obsolescence, you keep an hold on it: use positive history to create precious objects. Some argued that we may not allow back-ups in that context (so that an object is really dead once data are lost). Alexandra also mentioned the concept of "Agathonic design": designing objects so that they improve over time. Why do I blog this? these are just quick issues that has been raised on the first day of the workshop. Others things have been mentioned and we will describe them later on in the write-up.